There is a huge amount of information available on the how’s and why’s of performance testing .NET applications, but it is often fairly subjective, narrow in scope, or doesn’t quite cover everything you were hoping to learn. 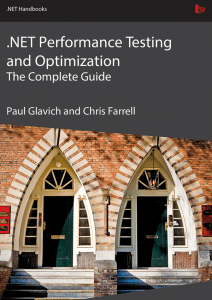 The Complete Guide to Performance Testing and Optimizing .NET Applications (by Paul Glavich and Chris Farrell) covers everything from why you should test, through the steps of setting up your test environment, all the way to how to actually run and record tests, and what you should be looking for. Once you’re up and running, Paul and Chris cover the fine details of tips and techniques to make the most of your performance testing, and some good ways to get fast results. With all this detail, you will have everything you need to make the most of your .NET code. In the first part of the Complete Guide, Paul and Chris explain why performance testing is a seriously good idea, and walk you through everything you need to know to set up a comprehensive test environment. It’s a excellent and comprehensive guide to getting started. Part 2 will walk you through both memory and performance profiling, and suggest steps you can take to get fast performance gains, as well as some good advice and recommendations on keeping your applications lean, mean, and fast! Paul Glavich is an ASP.NET MVP with over 15 years of industry experience ranging from PICK, C, C++, Delphi and Visual Basic 3/4/5/6 to his current speciality in .NET with C#, COM+ and ASP.NET. Paul has been developing in .NET technologies since .NET was first in Beta, and was technical architect for one of the world’s first internet banking solutions using .NET technology. Paul has authored books on Beginning AJAX in ASP.NET and Microsoft ASP.NET AJAX, and is currently focusing on Microsoft ASP.NET AJAX and Windows Communication Foundation technologies, has presented at the Sydney .NET user group and TechEd, and is also a board member of www.aspinsiders.com. In the event of particularly unruly hecklers, Paul also holds a 4th degree black belt in Budo-Jitsu. Chris Farrell has over eighteen years of development experience, and has spent the last seven as a .NET consultant and Trainer. For the last three years his focus has shifted to application performance assurance and the use of tools to identify performance problems in complex .NET applications. Working with many of the world’s largest corporations, he has helped development teams find and fix performance, stability and scalability problems with an emphasis on training. When not analyzing underperforming web sites, Chris loves to spend time with his wife and young son swimming, bike riding and playing tennis. His dream is to encourage his son to play tennis to a standard good enough to reach a Wimbledon final although a semi would be fine.